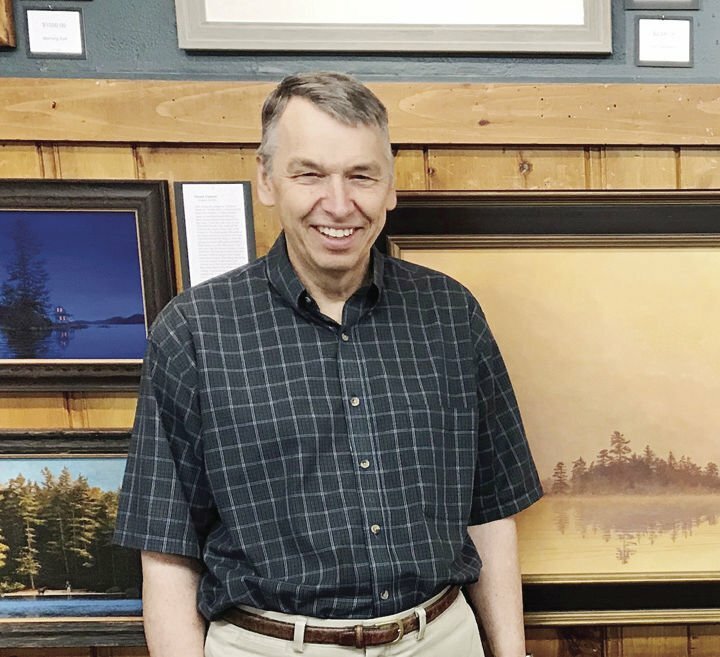 WOLFEBORO — The Art Place in downtown Wolfeboro will open its semi-annual Peter Ferber Gallery Show featuring new original paintings by the local well-known artist on Saturday, Feb. 16. The unveiling and artist’s reception will commence at 9:30 a.m. All are welcome to attend and meet the artist. Ferber describes his new work by saying, “So many of the paintings in this show are the result of moments. The moment as I’m crossing the lake and two islands, a point, and a mountain juxtapose with each other to form a wonderful composition — at its core a simple arrangement of abstract shapes and lines that is pleasing to my eye. A moment further along, and though all the elements are still in view, the relationship between them has shifted and the appeal as a painting is gone. "The moment an antique runabout’s engine rumbles to life and begins to back out of a boathouse for an evening run — the anticipation of what kind of boat it will be and the thought of the fun excursion to come makes me want to record it visually. "The moment I approach a tiny island at the entrance to an inlet and the setting sun is at the perfect angle that fringes the pine trees with a golden halo and glints off the water. When I returned a few minutes later, the light had changed and the highlighted shapes were no longer visible. 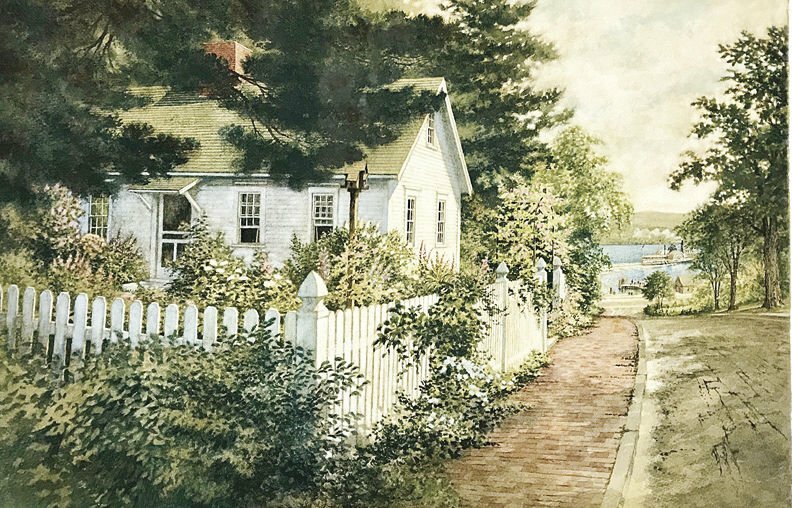 "The moment I was driving down a side street in Meredith and caught a glimpse of an old cape, a fence, a garden path, a birdhouse, and a little bit of the bay at the bottom of the hill. "The moment in Cape Porpoise [Maine] on my way for lobster, when the sun spotlighted the end of an old wharf and some dinghies, making them jump out against the shadowed, weathered walls of the fish houses. "The moment I was walking the dog one moonlit evening before Christmas, and caught sight of a neighbor’s Christmas tree through the window that gave me goosebumps — as if in an instant I was seeing something from my grandparents era. He said, “Once in the studio, these moments turn into hours and days, and weeks sometimes, as I work with the inspiration to capture the feel and the look on paper or board, in watercolor, oil and acrylic. With some, it’s a simple matter of rendering exactly what I saw. Others require more tweaking to bring out the moment, and some need a lot of careful arranging through many generations of sketches to come up with an image that at the “moment” was more a concept in my mind triggered than a literal view. The image I wanted did not really exist, and I have to really work to get the elements to come together and create the feel that came over me at that moment. Peter Ferber has been showing at The Art Place gallery in downtown Wolfeboro since the early 1990s. The Art Place is the exclusive gallery for Peter Ferber’s original artwork, and produces most of his limited-edition prints. Since 1994, Ferber has painted the official posters for the New England Chapter of the Antique and Classic Boat Society’s annual show, which also comes as highly collectable artist proofs. Ferber has exhibited in more than 50 other shows in New England and the Midwest. More than 100 reproductions of his work have been made, including more than 70 limited-edition prints. If there is a major weather event, the show will be postponed until Sunday, Feb. 17, beginning at 11 a.m. Peter Ferber’s Gallery Show at The Art Place will be on display through March 2, or as long as paintings are available. The Art Place is located at 9 North Main St., downtown Wolfeboro, and is open year-round. Winter hours are Tuesday-Saturday, 9:30 a.m. - 5 p.m. For more information, call 603-569- 6159 or 866-569-6159.